rom the top fully compressed without springs (the springs are removed before putting in the oil). 2) I overfilled fork oil by about one inch (25.4 mm). The oil level will be 3.7 inches (94 mm) from the top fully compressed without springs. 3) I added an additional spacer 1 1/16 inches wide x 1 5/8 inches long from home depot #12871-62497-1, which is a 5/8 inch PVC coupling 25¢ each. It is very tight to put in. It raised front end by maybe ½ inch (12.7 mm) or more. 4) I re-torqued all front fork mounting bolts. Some of the torque specs for the Virago 250 are listed below. 5) I added a fork brace. The front fork brace that I am using is a “universal” brace. If you are buying a universal fork brace, you will need to take your lower fork measurements. Below are the measurements from my bike. 187 mm top of lower fork where brace is to mounted – center to center. 133 mm top of lower fork where brace is to mounted – inside measurement. 54 mm top of lower fork where brace is to mounted – diameter. Here are the measurements of the brace that I have: Fork case diameter is 60 mm. Clamp will fit a 60mm fork case (slider). (The lower tubes of the Virago 250 forks are 54 mm wide, so I had to add a 3 mm strip of thin metal so the clamp can be properly tightened. See the thin metal strips marked in green in the upper right of the picture.) Fork tube spacing is 184 to 185mm. The center-to-center distance between the fork cases is 125 to 127 mm. The clamp height is 22mm. 6) If you have removed your stock front fender, I would highly recommend that you re-install it. 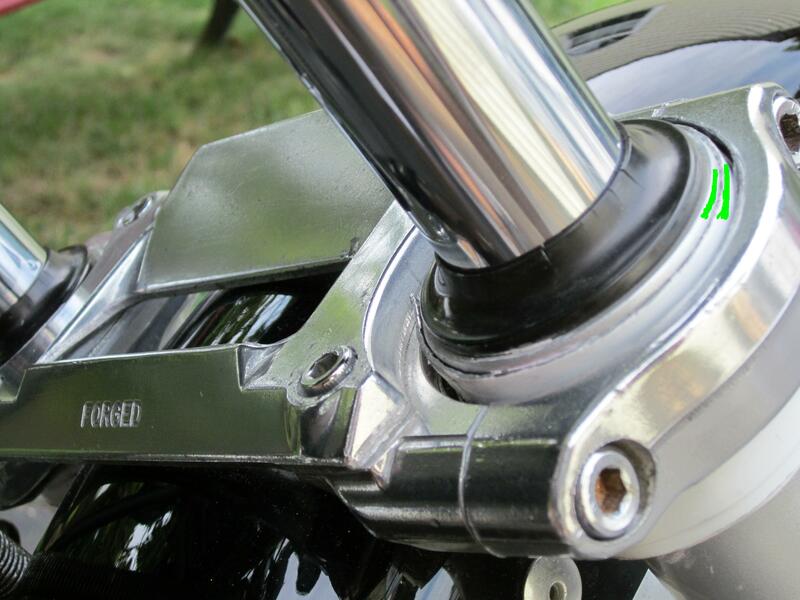 The stock front fender bracket is approximately 3mm steel and functions as a light-duty fork brace. The torque specification for the four 10mm front fender bolts is 14 ft lb. If you happen to have a extra front fender, you can add just the bracket part to your front fender to increase it’s performance as a fork brace (there is room enough to add two extra fender brackets to the front fender). 7) This is not a front fork item, but can affect handling in general and can cause front fork wag – I tightened the two allen bolts that secure the rear fender to the frame. The torque spec for the rear fender to frame allen bolts is 43 ft lbs (60 Nm). 8) This is not a front fork item, but can also affect handling in general and can cause front fork wag – I re-torqued the swing arm pivot bolt. The torque spec for the swing arm pivot bolt is 33 ft lbs (46 Nm). The heavier fork oil, 1 5/8” added spacers, and added fork brace reduced front end wag. Before I did this mod, my Virago 250 would sometimes develop front end wag – usually at high speed on windy bridges – keep in mind I have a Rifle Sport fairing, which probably added to or even caused the problem. The Virago 250’s front forks are not high performance, but I think they are under-rated. They get some criticism, but I think the forks are fine for most people, especially if the combined weight of the riders is less than 250 pounds. Virago 250 front springs have two stages – as forks are compressed the first 1.33 inches is softer (.80 kg) and the last 4.17 inches is harder (1.15kg). I weigh 210 pounds – .917 kg/mm is the optimum spring rate for my weight. So the first 1.33 inches of travel on the Virago 250 forks will always be too soft for me. Since the Virago 250 front end dives when you apply the brakes hard, it is easy for someone to think the forks are too soft. But after the fork gets through the first stage, you still have over 4 inches of travel at a 44% higher spring rate. This entry was posted in Motorcycles and tagged servicing front forks Virago, servicing front forks Virago 250, too heavy for Virago 250 forks, V-Star 250, Virago 250, Virago 250 cheap fork brace, Virago 250 fork brace, Virago 250 fork modifications, Virago 250 fork mods, Virago 250 forkbrace, Virago 250 forks too soft, Virago 250 handling, Virago 250 handling improvement, Virago 250 maintenance, Virago 250 modifications, Virago 250 mods, Virago 250 need better forks, Virago 250 updates. Bookmark the permalink. I and my baggage go about 260 lbs. I obtained some larger rear shocks that fit the bike. I never replaced my rear shocks – so I do not have any specific experience. If I needed new shocks, I would probably get them on ebay. 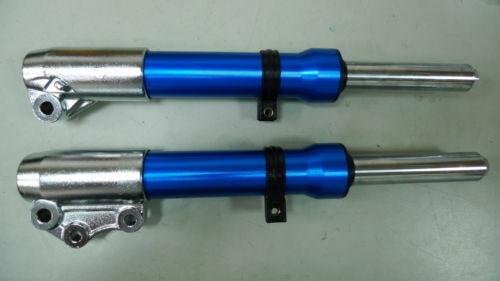 I would buy shocks that are the same length or longer (I would not buy shorter shocks). The stock rear XV250 shocks are 11 7/8 inches eye to eye with wheels on the ground. With my gear, my weight is 230 pounds and I have found the stock rear shocks to be fine – on the XV250, it is the front forks that need a little modification. I never saw a fork brace made for the XV250. I just bought a universal fork brace on ebay and modified it slightly to fit. The seller just had the one fork brace for sale. If you are buying a universal fork brace, you need to take your lower fork measurements. 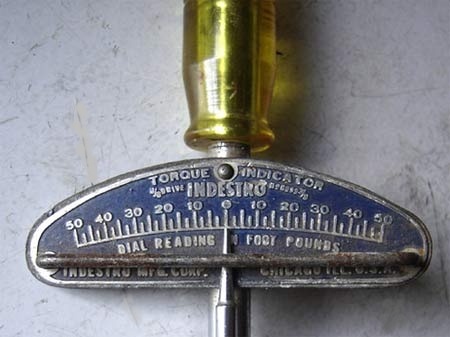 Here are mine – but you should measure your bike just to make sure in case they are different. Hope this helps. Let me know how it turns out. Thank you for this excellent how-to post. I’m cleaning up my ’96 Virago after my wife and daughter used it for several years. Needed it’s first set of new tires at 9600 miles, so I decided to change the fork oil while in there. No shop manual, so luckily I found your site. Switched to 15 wt oil, over-filled to 4″ down. Bought your PVC pre-load spacers but was a little nervous that the plastic would get chewed up over time, and might foul the oil. After a long time looking, found flat washers the perfect size. Home Depot, “Crown Bolt” brand, hanging orange plastic view package of 6 half inch flat washers. Bar code 30699 19861. Just the right outside diameter. I stacked 6 in each fork, 3 above and 3 below the stock “pipe” spacer, and it added something less than an inch to the preload. Just did my test ride on a chilly day in Colorado and I’m very pleased. Front is quite firm with my 225 lbs. And it does seem to set higher. Thanks again! The washers will probably hold up better than the PVC spacer.